The Navajo use the name Dine because it refers to a term from the Navajo language that means people. The first Navajo Indians lived in the western part of Canada a little over a thousand years ago. They belonged to an American Indian group called the Athapaskans. The Navajo Indian tribes began to travel south, and most settled along the Pacific Ocean. Their tribe today is called the Northwest Coast Indian Tribe. The Navajo Indians who settled in southern Arizona and New Mexico then became the different Apache tribes. When they reached the Southwest, they began to learn a lot of things from the Pueblo Indians. They learned weaving, how to make clothing, and art. By the 1600s the Navajo had become capable of raising their own food, and making their own blankets, clothes etc. 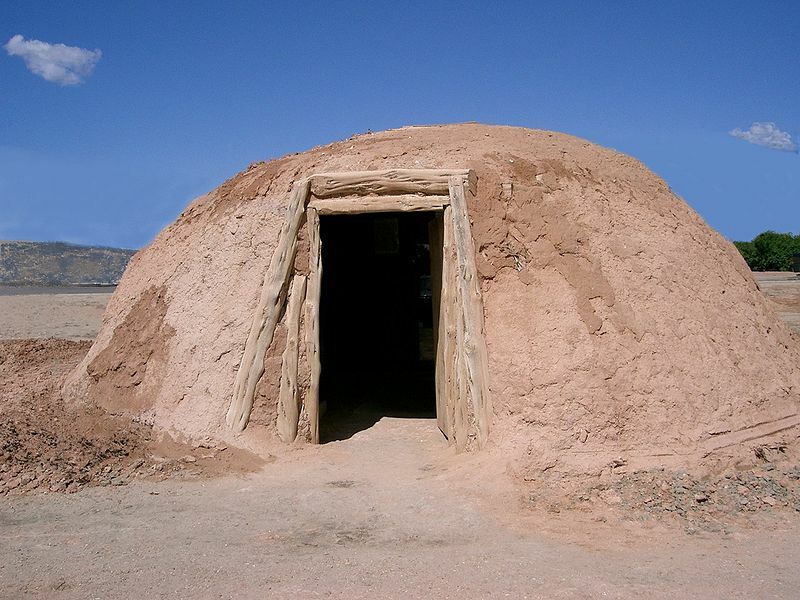 The Navajo Indians lived in homes called hogans, which were made from wooden poles, tree bark, and mud. The hogans were always made to face the east for sunlight. The Navajo Indian tribes made summer and winter hogans. The summer hogans would have one side of the home completely open. The winter hogans were built more weatherproof with mud, and partly stone. Around 1610, Santa Fe, New Mexico was founded and became the most important town in the New Mexico colony. In 1851, the Americans built Fort Defiance, to stop the Navajo raids that took place between 1849 and 1851. General James Carleton became the commander of the American Troops in 1862. He had the plan to build a fort for the Navajo Indians and force them all to a reservation. The fort became quite popular by the name of Fort Sumner. The Navajo Indians decided not to surrender, so by March of 1864 more than five thousand Navajos were being held by the soldiers as prisoners. They were forced to walk 300 miles to Fort Sumner in eastern New Mexico. This walk became a very important part of Navajo Nation history and is famously known as “The Long Walk.” The famous treaty of 1868 was signed giving them their own territory and freedom. Later in 1869, Fort Sumner was abandoned, and purchased by a rancher. The Navajo Indian were hunters and gatherers until they came in contact with the Pueblos, and the Spanish. They then learned the techniques from the Pueblos and the Spanish to grow corn, beans and squash. They eventually got into trade, trading blankets they made from wool, clothing, and cattle. Navajo Indian men were the political leaders, hunters, and the warriors. The Navajo Indian women were the farmers; they tended the livestock, did most of the cooking and took care of the children. The Navajos base their way of life on a belief that the physical and spiritual world blend together, and everything on earth is alive and their relative. They worship the winds, sun, and watercourses. The Navajo are also cautious about death, and rarely talk about it. The Navajo Indians have two big kinds of ceremonies; one is the Blessing Way, which keeps them on the path of wisdom and happiness. The second major kind of ceremony is the Enemy way. The Enemy Way is to discourage evil spirits and eliminate ghosts. The Navajo reservation is currently the largest reservation in the United States, with over 200,000 people throughout their 27,000 acres. The Navajo Indian tribe is closely related to the Apache tribes. The Navajo Indian tribes are currently located in Arizona, New Mexico, Utah, and Colorado. Most of the tribes are still currently living in their traditional territory today. Today the capital of the Navajo Nation is located at Window Rock in Arizona. Window Rock currently contains the World War II memorial. In the Navajo culture, shirts were not used. Men wore breechcloths, and women wore Yucca fiber woven skirts. Also, deerskin ponchos and cloaks of rabbits were worn by both men and women to keep them warm. And in the later days they wore clothes woven from the wool of sheep. In the colder weather, the Navajo Indians wore slippers that were called moccasins. 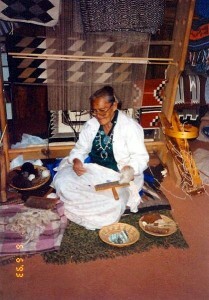 The Navajos were very big into jewelry and weaving. The blankets they woven were often called Chief’s blankets because of their value. After the 1900s the Navajo silversmiths began to create Native American Indian Jewelry. Soon after, the silversmiths introduced turquoise into their jewelry making process. This process made Navajo jewelry pieces much more sought after by jewelry collectors. The primary source of silver for jewelry was American coins until about 1890. The American coins then got substituted for Mexican pesos in 1930. The most common language spoken in the southwestern United States by the Navajo’s is Athabaskan. Athabaskan is the most spoken Native American language in the United States. Most Navajo Indians speak English because the Navajo language is very difficult to learn. The language was so hard to learn that it was used as a secret code in World War II. Athabaskan is conventionally divided into three groups based on geographic distribution: Northern Athabaskan, Pacific Coast Athabaskan, and Southern Athabaskan. Navajo and the five Apache languages are in the Pacific Coast category.